In 2011 Derek Eland worked as an official War Artist embedded with the British Army in Helmand, Afghanistan. Diary Rooms describes the results of Derek’s time there. 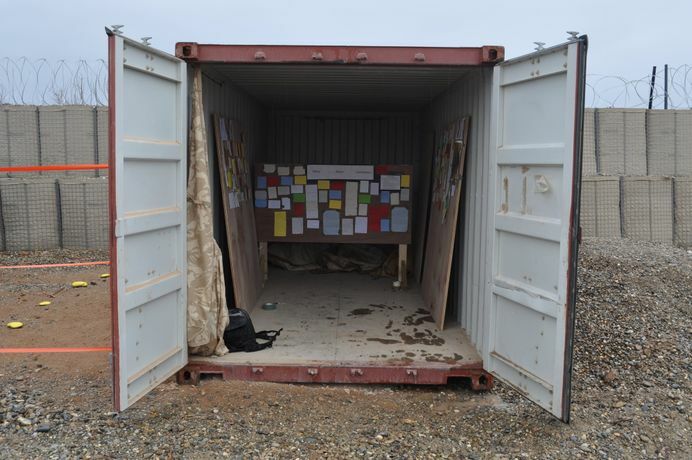 Derek Eland visited Afghanistan to create a ‘Diary Room’ experience for front line soldiers, both British and Afghan, by providing them with blank cards and offering them the opportunity to write down their immediate thoughts. The stories and comments written on the cards are raw, honest and varied, from the remarkable to the mundane, the extraordinary to the everyday. The reality of everyday life for troops sits alongside emotional accounts written in the immediate aftermath of battle. Diary Rooms presents a collective self portrait of individual experiences on the front line of a contemporary conflict – with soldiers often referring to ‘two wars’, one involving bullets and bombs and the other which goes on in a soldiers head when everything goes quiet.